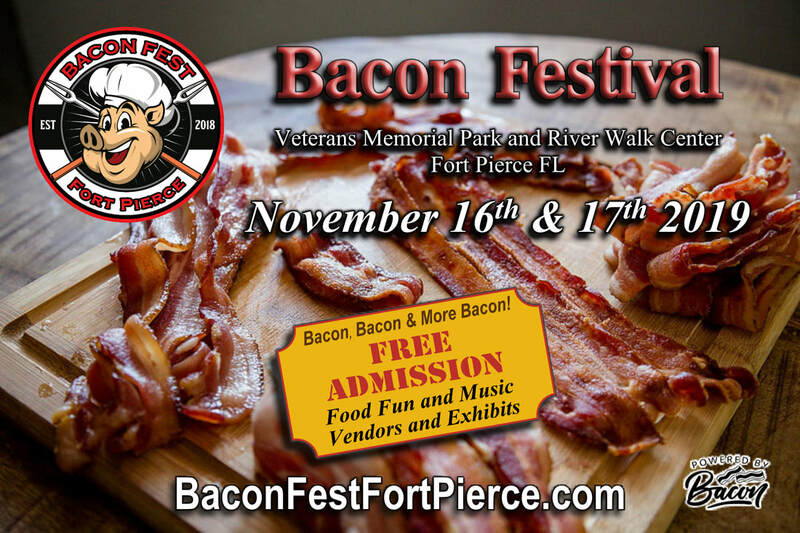 ​it’s Time for the Annual FORT PIERCE BACON FESTIVAL. With a seemingly endless choice of Bacon recipes, in November, all of your favorite dishes can be served up special by adding some delicious BACON to it! Imagine if you can, every type of festival food from Quiche and Kabobs to Chocolate Covered Bacon to BLTs. In addition to all of the succulent Bacon dishes and tasty libations, this 2-day family friendly festival will also have some great live music and entertainment, an interactive Kid’s Fun Zone, and plenty of vendors and exhibits to shop & explore. Admission to the Bacon Festival is FREE! The beautiful Fort Pierce River Walk and Veterans Memorial Park is the perfect home for the Bacon Festival. This popular waterfront location is just north of the Fort Pierce City Marina and is known for its gentle breezes and amazing view of the Indian River. ​"For the Love of Bacon" The Bacon Festival was created to bring people together who have a mutual love for the great taste of Bacon. Because there are so many Bacon dishes, we set out on a mission to find some of Florida's best Bacon Recipes and look forward to bringing out the very best lineup of mouthwatering Bacon vendors available. Interested in participating as a Vendor? Select the appropriate button below for more info. ​"Do you want Bacon with that?" The Bacon Festival will showcase many great recipes, each of them with the option to include some delicious Bacon. Many Great Sponsorship Opportunities are still available. Please reach out and reap the benefits of this delectably delicious festival! We look forward to hearing from you. Sponsorship Opportunities are still available for the Bacon Festival.